What was that high pitched chirping and flash of iridescent green that just whizzed past at lightning speed? You just got buzzed by a hummingbird! The fall migration is passing through Houston, and these feisty little birds seem to be particularly abundant this year. 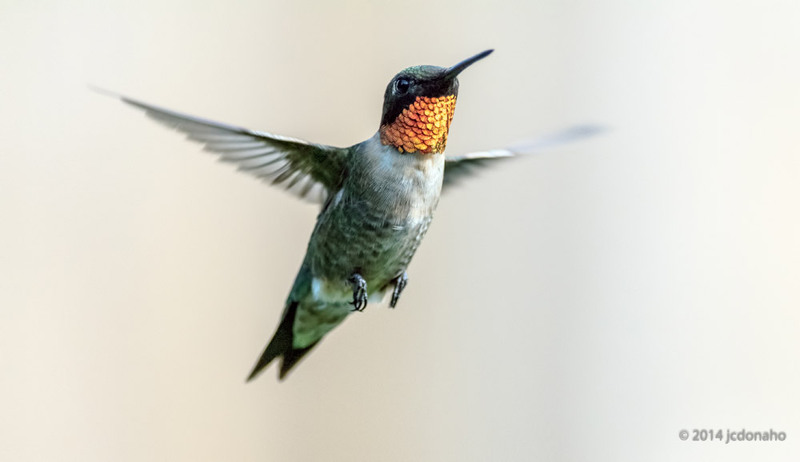 Houston does not have (for the most part) any resident hummingbirds, but a few species pass through in spring and fall as they fly between their nesting grounds in the northern states and Canada, and their wintering ground in Central America. The northward spring migration is much more diffuse than the fall event – you may hear a hummingbird or two in February or March, but they don’t linger. However, in late August through September and into early October, hummingbirds can be very evident in Houston. These marathon travellers will pass through our area for about 4 to 6 weeks, stocking up on fuel to take them over the Gulf of Mexico to their winter abode. They are particularly abundant on the Gulf Coast, where inclement weather can force them to stay put until a more opportune time comes to complete the migration. 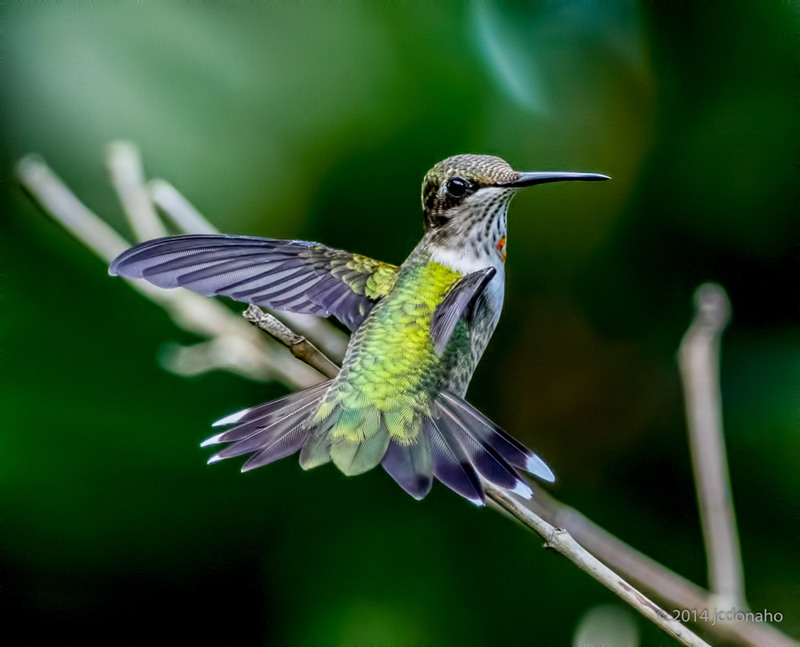 Rockport, Texas hosts a huge “Hummerbird Festival” every mid-September, with lots of talks on hummingbirds and other birds, butterflies, etc., and home tours to see gardens that are particularly full of hummingbirds. It’s over for this year, but put it on your calendar for future years and check it out! 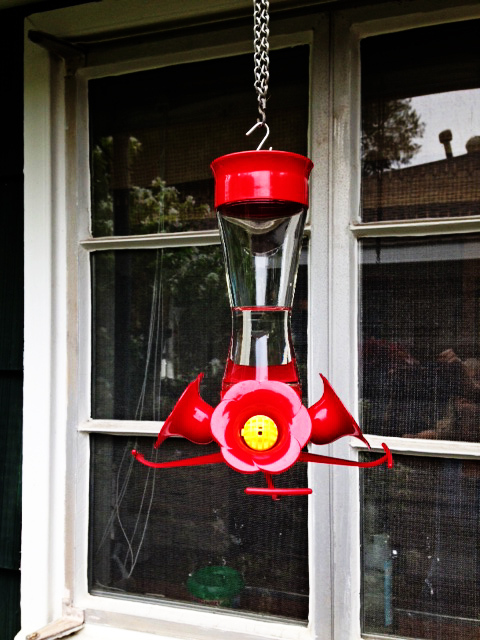 Most hummers you see in Houston (and in Rockport) are Ruby-throated Hummingbirds. Males are a metallic green with white bellies, and are named for the patch of dark feathers on their throat that glows a brilliant, iridescent ruby red when the sun hits it just right. Females and immature males do not have the spectacular throat coloring, and are white underneath. Some young males may have a fleck or two of red on their throat. Two other species are sometimes seen here – the Rufous Hummingbird and the Black-chinned Hummingbird. Juveniles and females of these species are a little hard to distinguish from Ruby-throated females and youngsters, but the males are distinctive. Rufous males are a bright bronze color, with an orangey red throat. Black-chinned males are green with a black throat, below which, in the right light, a brilliant violet band will flash. Farther west, in the Big Bend area and west into New Mexico, Arizona, and California, hummingbird diversity is much higher. About 15 or so species are known from the USA, and most of these occur in the western states. For the apex of hummingbird diversity, head to the highlands of South America (e.g., Colombia, with about 140 species), where dozens of different species can be seen, some of them truly spectacular. Most of these are residents in the tropics and do not migrate. Male and Female Ruby-Throated Hummingbirds, slow motion, August 2010 from Hummer Lover on Vimeo. All hummingbirds behave similarly. Masters of speedy, controlled flight, they can hover in place, move backwards and forwards, dive and soar with incredible speed and precision. They can reach speeds of up to 60 mph, their wings whirring at 80 beats per second. Males in particular are territorial and aggressive, cheeping furiously as they drive off rivals from a good food source. Hummingbirds’ main food is flower nectar, so they are important pollinators of certain species of plants. They especially seem to gravitate to red flowers, although other colors are visited. Their long thin beaks and even longer tongues allow them to reach inside floral tubes that are much too deep for most butterflies and bees. Since birds in general have a poorly developed sense of smell, flowers pollinated by hummingbirds typically have no scent. Hummingbirds also eat small insects such as fruit flies and gnats, catching them on the wing or finding them inside the flowers they probe for nectar. Because they love sweet fluids, it is easy to provide feeders for hummingbirds, and several designs are available. 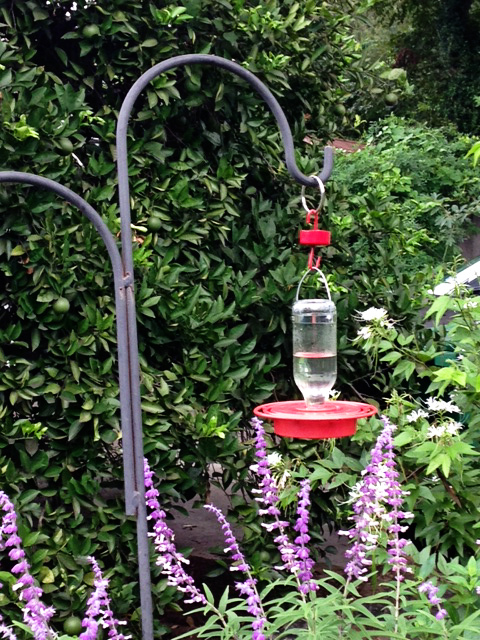 Hummingbird food is simple to make; you just need sugar and clean water. DO NOT use any other sweetener – including honey or other types of sugar –just your standard white table sugar. Use four parts water to one part sugar. Bring the water to a rolling boil, add in sugar and stir until it dissolves, then turn off the heat. Do not cook it too long or it will start to caramelize. Let the solution cool and you are ready to fill your feeders. Keep extra sugar solution in the refrigerator. IMPORTANT! If you want to feed hummingbirds you must commit to regularly changing their sugar water food! Sugar water ferments and/or grows mold quickly, and when spoiled it can make hummingbirds sick. Since you will need to clean the feeders about every three days, do not fill them too full or you will waste a lot of sugar solution. Fill them from between ¼ to ½ full, at least until you see how fast the hummers empty them. DO NOT add red food coloring, and avoid commercial solutions with food coloring. Coloring is not necessary, as most feeders have red parts built in to attract the hummers’ attention. Like spoiled sugar water, food coloring is bad for the hummingbirds’ health. Every three days, even if your feeders are not empty, clean them thoroughly with hot water and refill them with fresh solution. At the end of the season you should sterilize the feeders either in the dishwasher or using a dilute bleach solution before drying and storing them until next year. I prefer to use glass feeders as these are easier to sterilize. A few guidelines on feeder placement – hummingbirds are not at all shy, so you can put feeders near your house where you can enjoy watching their activity. I put one right outside my kitchen window, and hang others around my back yard, especially near trees or bushes where hummingbirds can perch between bouts at the feeder. If you put out more than one feeder (I recommend this! ), don’t put them too close, and ideally place them out of sight of each other to avoid their being monopolized by one dominant male. In a good season, you will have dozens of hummingbirds – and the more feeders, the more hummingbirds! I usually put out from 3 to 9 feeders, depending on activity. 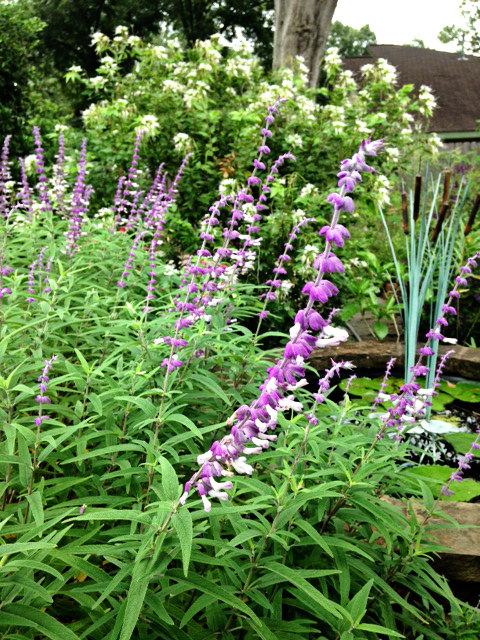 Of course, hummingbirds also visit flowers for nectar. 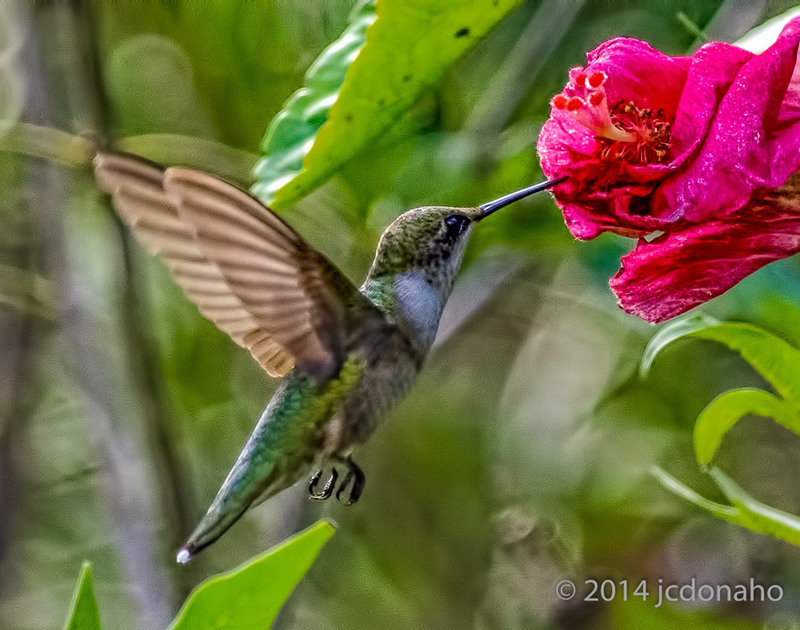 The classic hummingbird flower is red with a long floral tube, but many others also bring them in. 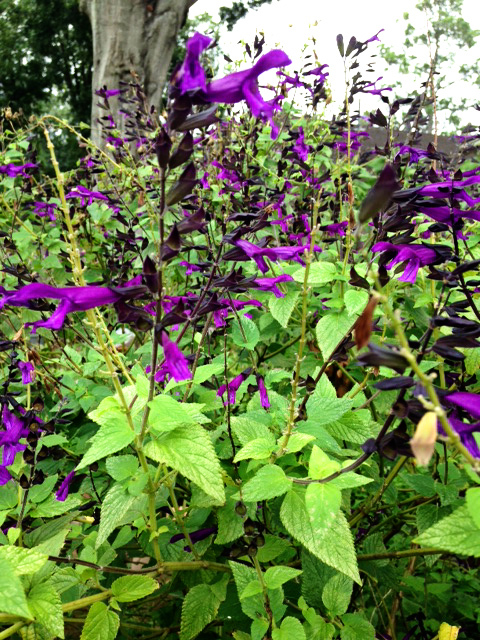 Some good choices are salvias (many varieties), hummingbird bush, coral vine, trumpet creeper, and russelia. Of course, if you have outdoor cats, you should not put out hummingbird feeders or any other kind of bird feeder! Hummingbirds’ jewel-like, glittering colors do not come from pigments, but result from the refraction of light hitting special structures on their feathers. The Bee Hummingbird from Cuba, less than 2.5 inches long, is the world’s smallest bird. The largest hummingbird is the Giant Hummingbird, from Patagonia, Chile. It is about the size of a cardinal, but only weighs half as much (about .65 ounces, or about 1/20th of a pound). The longest hummingbird is the Black-tailed Trainbearer from Colombia. The male’s total length is about 10 inches, including its 6.5 inch tail! 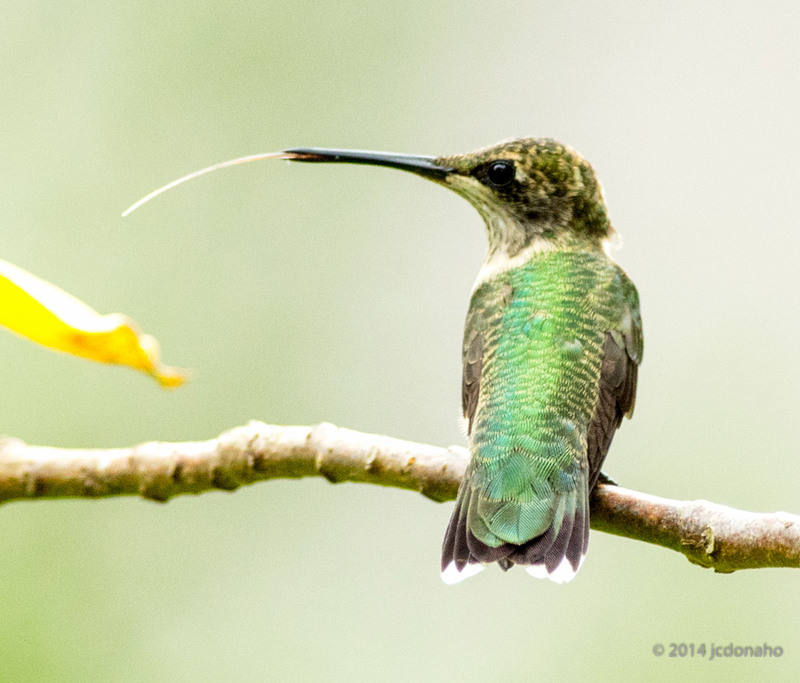 The Sword-billed Hummingbird from Ecuador has a 4 inch long beak, almost as long as its body! Check out the PBS Nature special on hummingbirds, “Magic in the Air,” for some amazing footage of these incredible creatures! Previous Post Gamers Unite: See how you'd fare in battle with Battleship Texas at HMNS Tuesday!